Maharashtra: Seeking to make the Lok Sabha polls a contest between him and Congress chief Rahul Gandhi, Prime Minister Narendra Modi Friday asked voters to choose between “imaandar (honest) chowkidar’ and ‘bhrashtachari (corrupt) naamdar”.Gandhi has been hurling the “chowkidar chor hai” jibe at Modi to claim irregularities in Rafale deal, while the PM has been calling the Congress chief as ‘naamdar’ (dynast).”You have to choose between imaandar chowkidar and bhrashtachari naamdar. 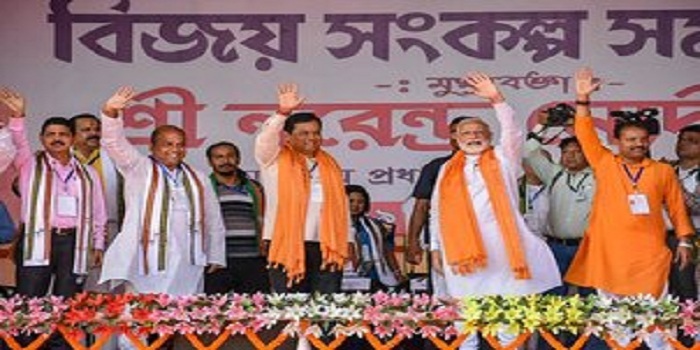 You also have to choose between heroes of India and supporters of Pakistan,” Modi said.At a rally here to campaign for BJP-Shiv Sena alliance candidates of Ahmednagar and Shirdi Lok Sabha constituencies, Modi said, “You have to decide the country’s future and which direction will it take in this election.” Modi said in the last five years, people have seen that his government is a strong regime which takes decisions.”You have seen Chowkidar’s government which is strong and takes decisions. Scams and decision-making delays were the order of the day during the remote-controlled government (UPA) earlier,” Modi said.